I am sharing the cut files for the Christmas scroll in my subscriber library. Click here to subscribe to my weekly newsletter and gain access to all the freebies. If you already have your password, click here to download them. 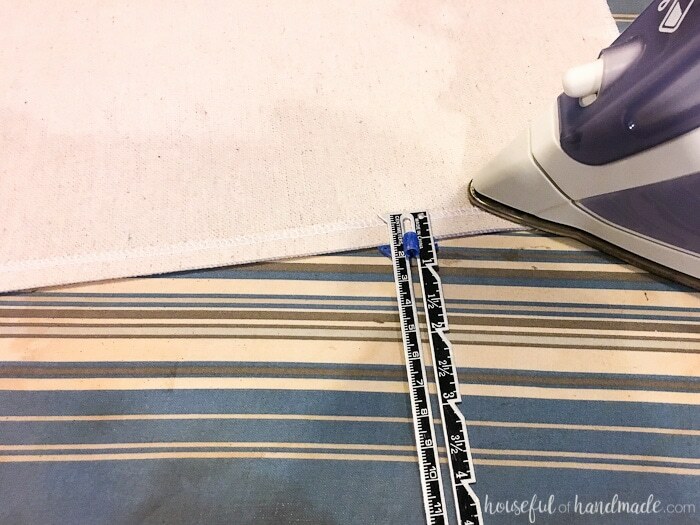 If you don’t have (or want to use) a sewing machine, you can iron the seam on the sides and secure with fabric glue. Start by cutting your stencil out. 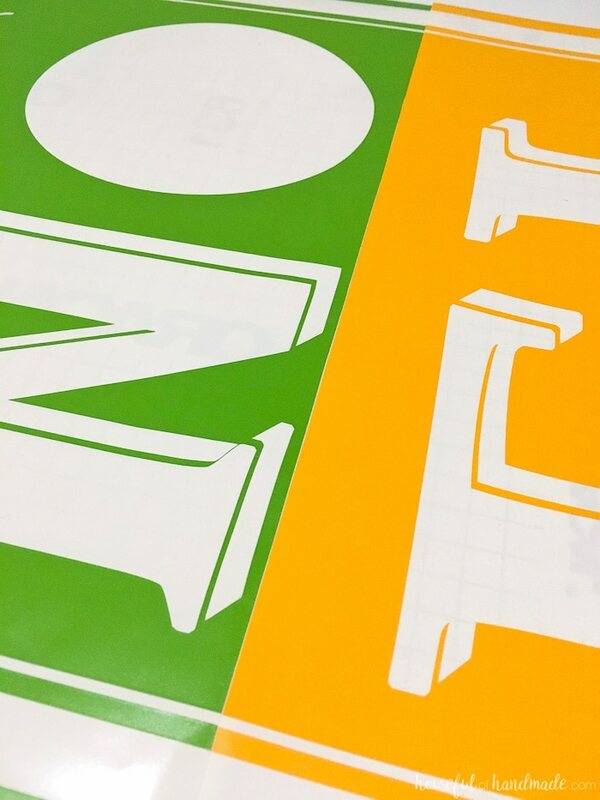 Since the design is bigger than the 12″ cut area, you have two choices: make a smaller scroll or piece together your stencil. Piecing together a stencil is not as hard as it sounds. 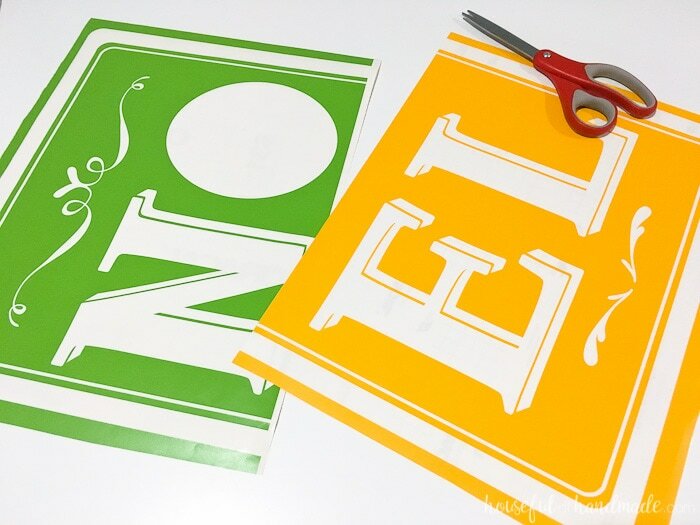 Before cutting the first half of the stencil, you will want to add a straight line cutting the stencil in half. It’s okay if it goes over the edges of the design a bit. 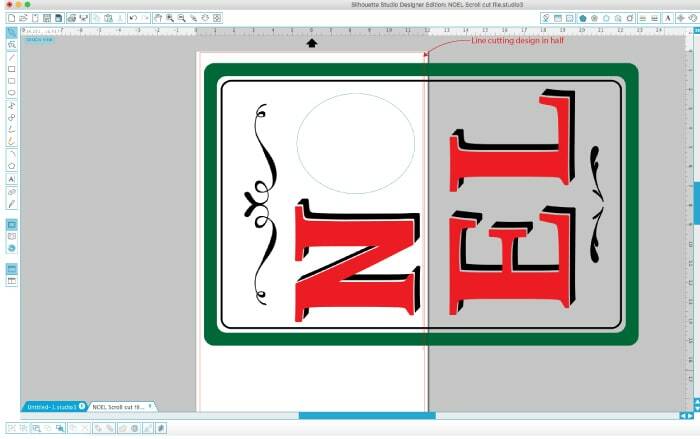 Also, pick a section of the stencil that has less points to match up to make it even easier. Group the line to the design. Cut the first part of the stencil out on your vinyl. 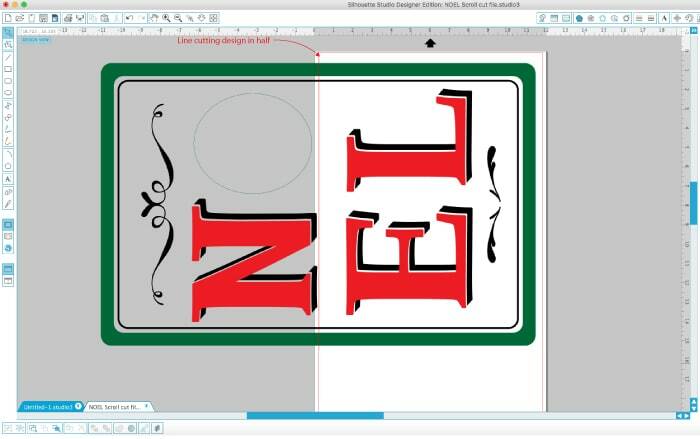 Then move the design so the second half of the stencil is in the cut area (your line should be grouped to the design so it will stay in the same place). Make sure the line is in the cut area too. Cut the second part of the stencil out on your vinyl. Weed out the parts of the stencil you will want to paint. Then on one of the halves, cut through the vinyl backing along the cut line you added to the stencil. Line the two pieces up and using tape on the backing, tape the two pieces together. 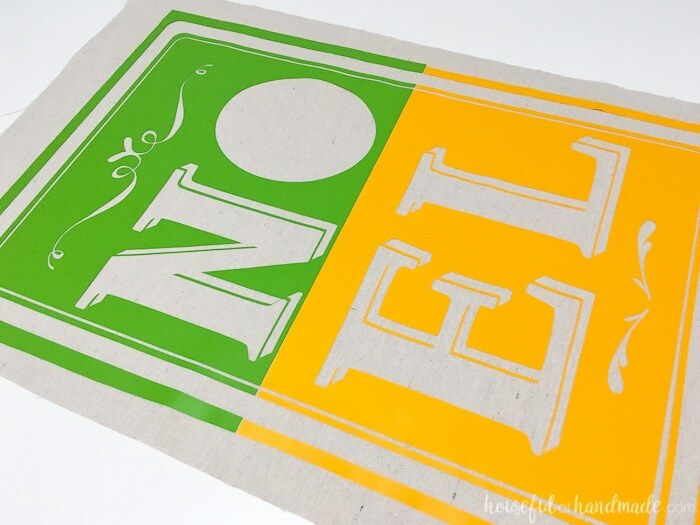 Now add your transfer tape to the front of the stencil. 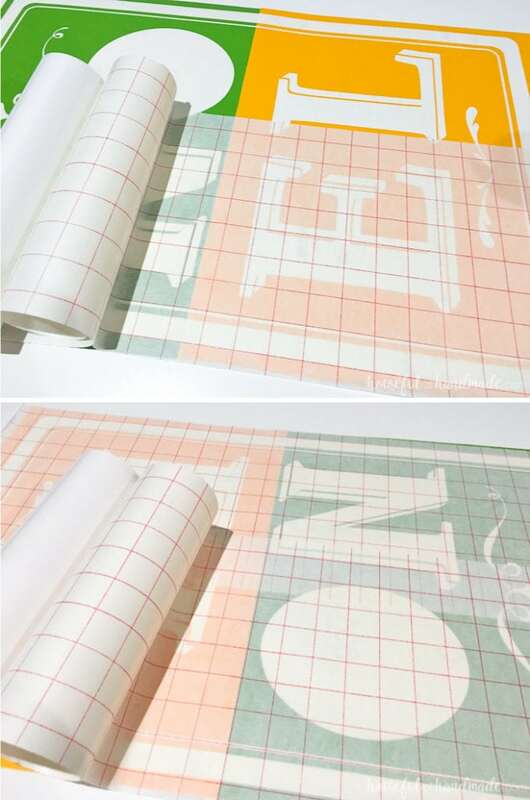 Unless you have very large pieces of transfer tape, you will need to use multiple sheets of transfer paper, just overlap the transfer paper so they act as one piece. 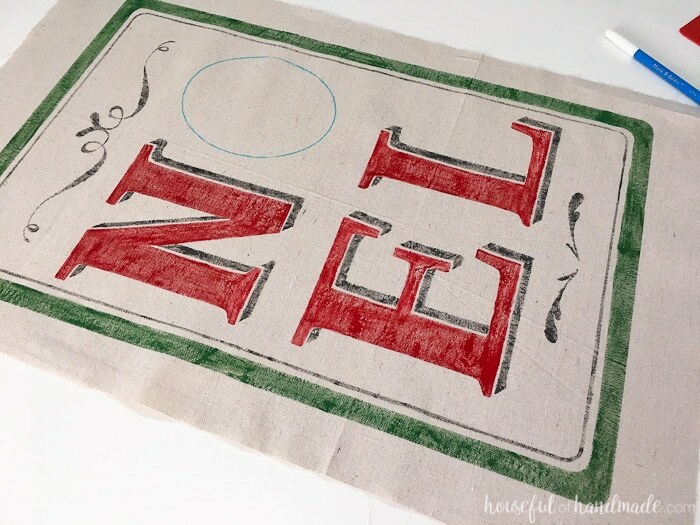 Peel the vinyl from the backing and then transfer it to your drop cloth. The drop cloth should be a little big around the outside. 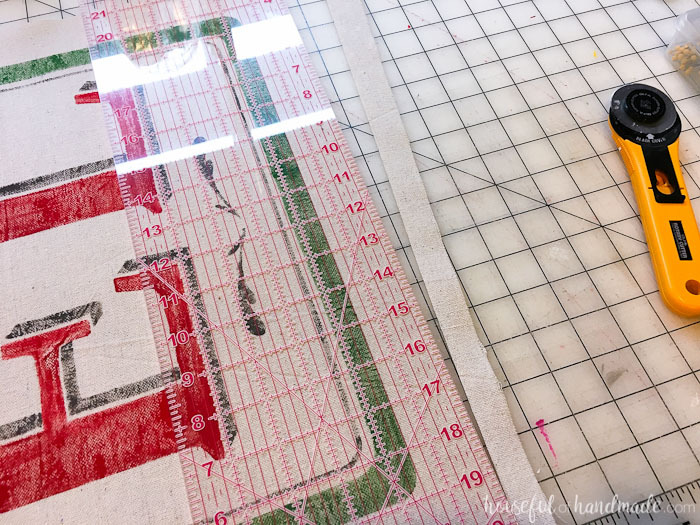 You will hem the drop cloth later, but it is easier to cut the fabric after you paint the design than to perfectly line up the stencil to already hemmed fabric. Now it’s time to paint. I used acrylic craft paint and a paint brush to add the paint to the drop cloth. There are a couple spots on the design where there is no line between the drop shadow and the letters, but these are easy enough to free hand paint. Also, don’t be too worried about making a clean even coat of paint. The texture of the drop cloth will show through and lend itself to the vintage look. 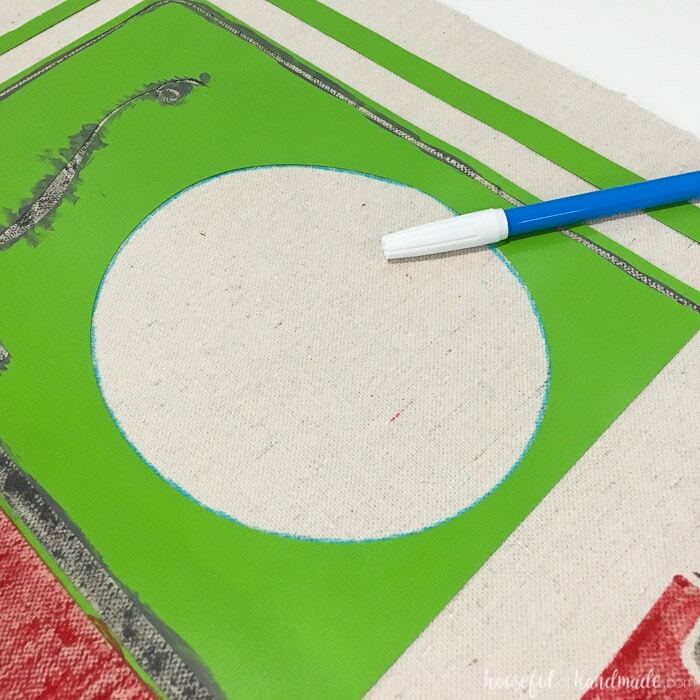 For the O, use a fabric pen to trace the circle. I used one that will disappear with water so I can easily spritz it with water when done to erase my line. 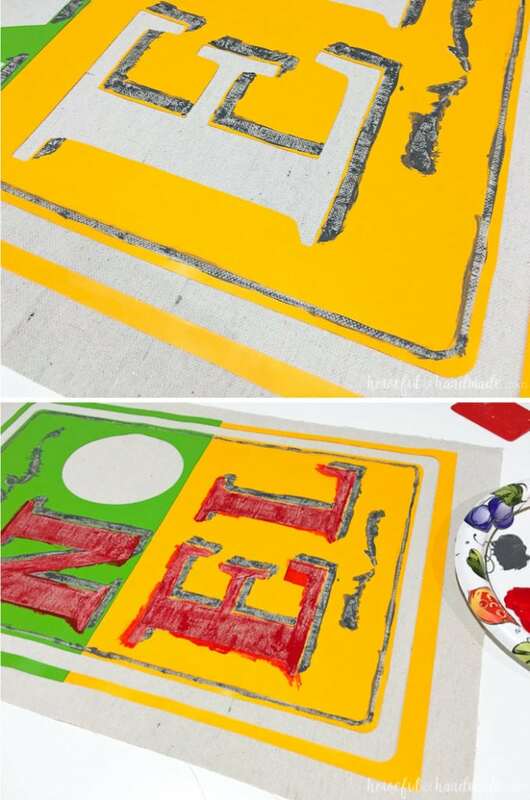 After the paint is dry, you can remove the vinyl stencil and admire your work! But don’t get too comfy, there are still a few more steps. Cut the excess drop cloth from around the design. I left 1″ on either side of the border and 1 1/2″ on the top and bottom of the border. Iron a 1/2″ hem on both sides of the Christmas scroll. I used my serger to finish the edges first, but it is not necessary since you will only see the unfinished edges if you look at the back of the scroll. 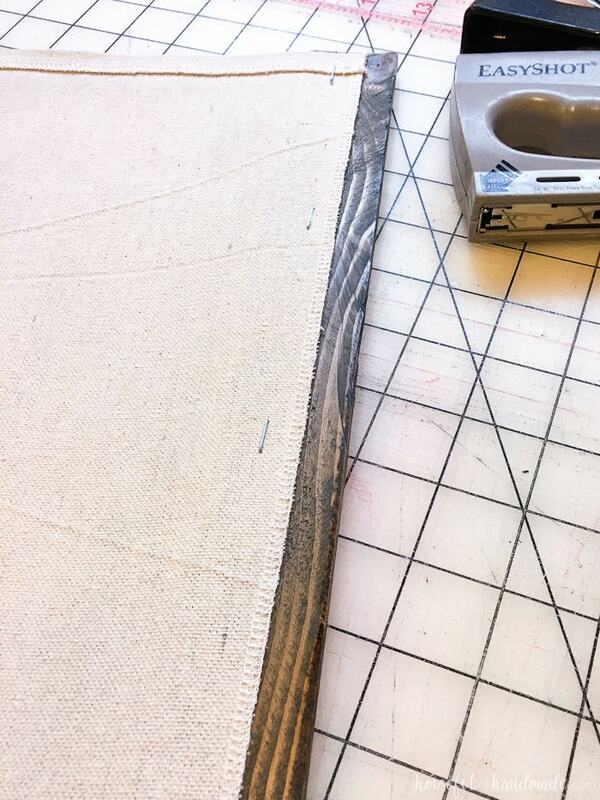 Run a straight stitch along the sides of the scroll to secure the hem (or use fabric glue). Cut your wood pieces to just slightly larger than the finished scroll. Stain or paint the scrap wood. Staple the scroll to the back of the scrap wood. Use a piece on the top and the bottom of the scroll. 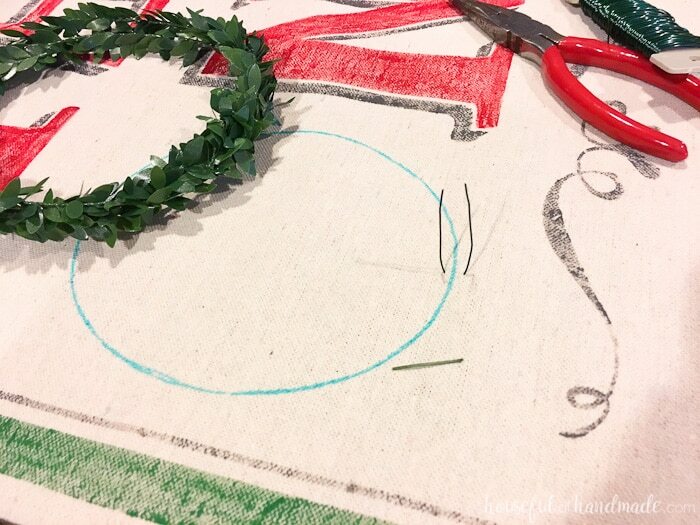 To make the O wreath, use the drawn on circle as a template for the size and shape of the wreath. My garland was pretty thin so I used 3 layers to make the final wreath. Twist the ends of the garland around each other to secure the layers together. Use a piece of floral wire, stick it through the back of the scroll at the top of the O. 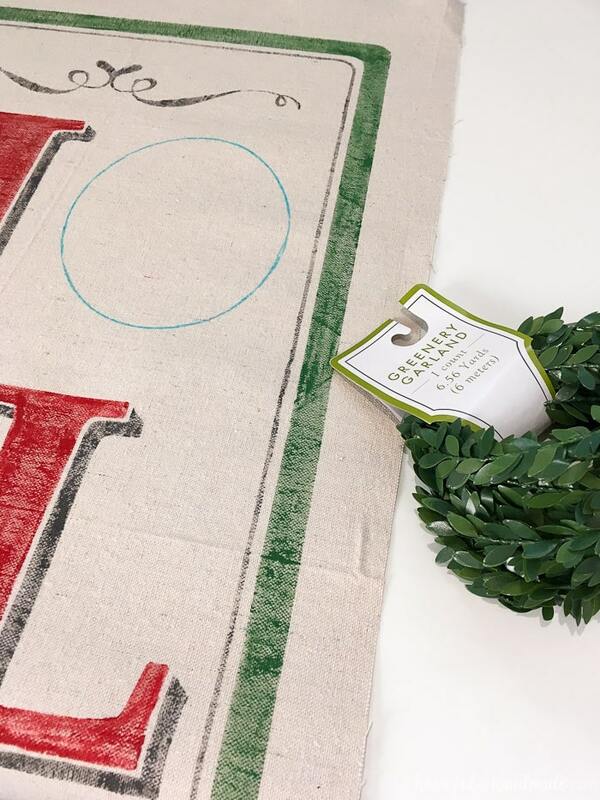 Place the wreath over the circle and secure with the floral wire. Repeat on the bottom of the wreath to hold it flat agains the scroll. Finally, attach a piece of ribbon to the back of the top of the scroll so you can hang it up! Don’t you just love how it turned out? 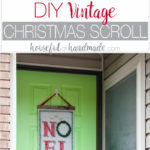 It looks like just like a beautiful vintage Christmas scroll, only you will know that you made it this year. And next year if I want a more classic Christmas wreath, I can use this beautiful vintage Christmas scroll as a wall hanging inside our home. Dont forget to subscribe to my weekly newsletter so you can get access to my library of freebies where I love to share all kinds of free printables and downloads. Thank you Lindsay. I love the vintage feel! Thanks so much Maria! 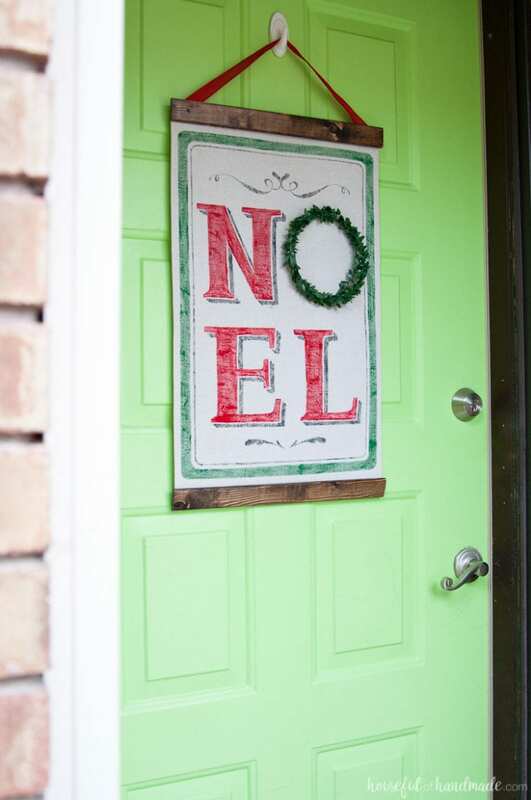 We love our green door. Have a very merry Christmas too! This is beautiful. I always use my Silhouette for making a stencil. Hand lettering is over-rated anyway. LOL! 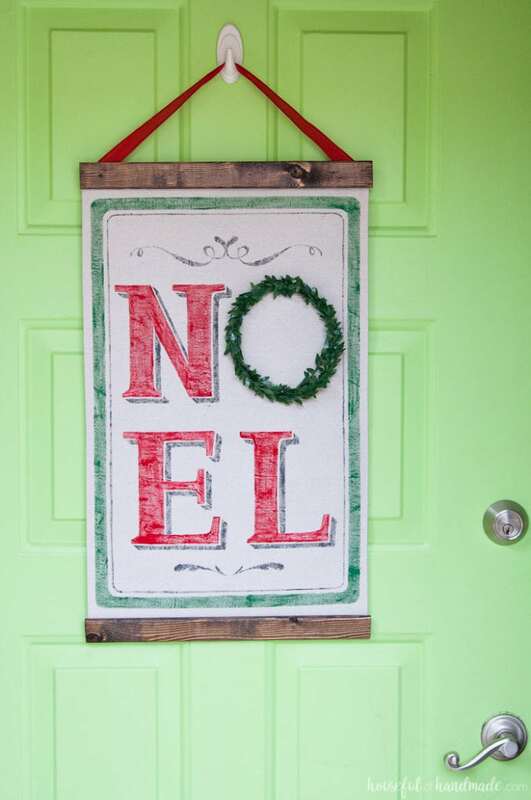 It turned out so nice and looks great on your door. Nice job. This is so wonderful! Is there anything a silhouette isn’t good for?! haha, just kidding but sometimes it does seem that way. I feel that way too! If I want it, I’m sure I can figure out how to make it with the Silhouette. Thanks so much Nicole. It turned out better than I could have hoped! LOVE! Your tutorial is awesome and very easy to understand. I’ll need to dust off my Silhouette to make one of these. Pinned. You definitely need to dust off that Silhouette! I use mine all the time. This is SO CUTE! What an awesome idea! I love the vintage look of it and I would have to agree. Drop cloths are the best!